I’ve had an eye on this trend for a couple of months now and it looks set to stay. 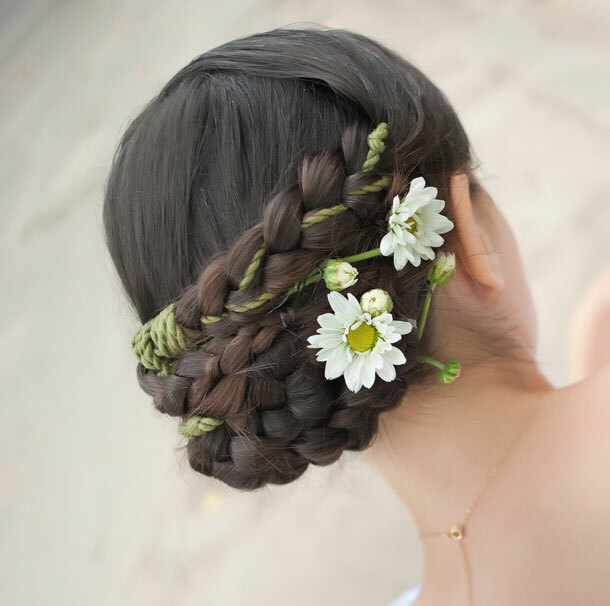 So, like it or leave it, the bohemian braid, or any braided hairstyle that creates that totally floaty, feminine look, is dominating wedding magazines and websites. Whilst this style works best with thick, heavy and wavy hair, the great thing with braids is that you can always wing it by incorporating the odd braided hairpiece, particularly if you’re enhancing a loose bun or updo, by encircling it with braid. The braid most evident on the cat walks at the moment is the flat braid or side braid that follows the side of the face from just off centre, resting gently over one of the ear and then swept up into a bun or left to mingle with loose curls. But there is also the rather chic half-up Bohemian braid, braids caught at the back of the head, braids that knot at the top of the head. Actually, anything with braids will do. Even if your hair is not as thick as some, you can incorporate a number of clever twists that suggest braids. Waves, trendrils, curls, braids – the stage is set for romance. If you are looking for inspiration and want to begin experimenting, YouTube is full of tutorials for braiding – from waterfall braids, to braided party hairstyles for medium and long hair, to cute bohemian curly. And for those with really long, thick tresses, have a look at the side braid Nicole Kidman recently wore at the Billboard Music Awards.